There are many forms that have developed in Chen Taijiquan’s 400 year history. The older forms are call Lao and forms are called Jia and so Laojia means old frame. Xin means new and so Xinjia means new frame. Frame means the set or frame of movements. The old frame forms have bigger circles and spiralling movements whereas in the new frame forms, the spirals are much smaller which make the forms more challenging as the waist is used even more. Beginners in the Tse Qigong Centre usually begin with the Chen 19 form as it is a good introduction to the Chen skill. It was created by Grandmaster Chen Xiao Wang and is based upon the principles found in Laojia. It is very good for giving the practitioners a taste of Chen Taiji yet does not take too long to learn or practise. Another shorter form is the Chen 38 which uses more principles of the new frame skill with more spiralling of the waist. It is slightly longer and has many interesting movements, moving the skill to another level. Performed correctly, it is very beautiful to watch, showing a perfect balance of Yin and Yang energies. Laojia is the longest form and is good for building stamina and fitness. It will also help to develop strong legs and bone Qi. Cannon Fist (Pao Chui) is a very powerful form with a lots of jumping, stamping and Fajing. It is not taught until later in the syllabus as the energy it creates in the body can be too strong if the body is weak or if the practitioner has not yet understood relaxation and good posture. 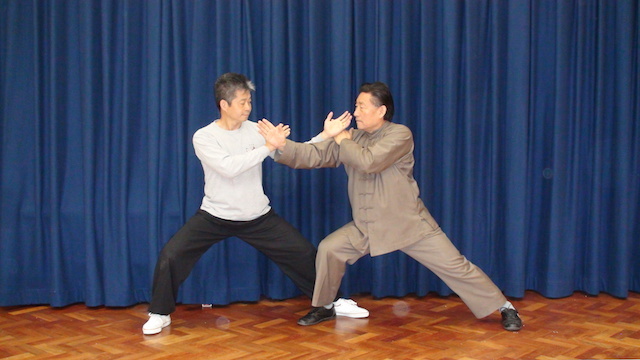 There are several weapon forms in Chen Taijiquan. One which is unique is the Da Dao – Spring and Autumn Big Broadsword. It is very heavy and really trains the whole body but particularly the arms and legs. There is also the straight sword, double straight sword, single broadsword, spear and the explosive Pao Cui (Cannon Fist). We do Tui Shou (Pushing Hands) to help us better understand and apply the energies and applications found in the forms but in a safe and non-combative situation. If we only think of using strength, our Taijiquan skill will be low level. High level is learning how to defeat an opponent using sensitivity, skill and footwork.